There’s this country song called I’m Gonna Miss Her sung by Brad Paisley. I don’t like it at all, because the man loves fishing more than he does his wife. In my neck of the woods men hunt and fish for pleasure. Simon, Andrew, James and John were career fisherman. I bet they liked to fish as much as I enjoy writing my stories. Yet when Jesus called them, they dropped their nets and went with him. Just like that. No questions why. I would like to think that if Jesus walked into a coffee shop where I was typing away on my laptop and He said, “I will make you a Writer for me” I would leave my laptop on the table and follow him. That would be a sacrifice for me. And I’m sure it was a sacrifice for those men who left their nets and obediently followed Jesus. My church gave its members a deadline in which to choose their cemetery plot in the lot by the church. My mother made the phone call for me and my sister. We chose what could be prime locations–our own little place in this world. Yes, we’re good to go. Not because we have a place to deposit our remains, but because we have a relationship with a man called Jesus. You can call me the procrastinator, because that is what I am doing. I have set a goal of 25 pages today as I did last week. Do you know how many pages I wrote last week? Three. Three whole pages. A long way from my goal. And today I’ve loaded music to my Palm T/X, read email, critiqued a chapter for one of my critique partners(at least that was writing related) and surfed the internet, but I haven’t written one word to my manuscript, Absalom’s Beauty. For one thing I’m stuck in the plot. I know what I need to have happen, but I’m not sure where it will lead. And most of all, I’m afraid I’ll not have enough words to write to make the 25 pages. Why do I allow that to stop me? This whole writing business is distressing at times. I will attend a conference in May. I’ll decide then if I should continue on this journey, because quite frankly, this writing business has become expensive. The problem I will have is that I’ll continue to have story ideas and must write them down. My prayer to God then is that if this is not His will for my life, he’ll stop the flow of ideas. For weeks now, my son has felt a burning desire to make his faith in Jesus known to the people of my church. He has one problem–extreme shyness around other people. As the mother bird, I wanted to “kick” him out of the pew to walk the long aisle to the front where the minister waited. But this decision had to be all his own. My only influence was to make sure he understood the basics: know you are a sinner, ask God to forgive you of those sins and to trust in him alone for eternal life. But the rest had to be up to him. He had to make the decision to move from the pew and up to the front. On April 20th 2008 my baby bird took that step off the edge of the nest and he flew even though it was a scary thing for him. I watched the Barbara Walters Special by way of DVR (wonderful invention for people who like to go to bed early). She delved into some exciting research on living longer. That’s not a bad thing. But I have a problem with the cryogenics thing. A family (a father, a mother and their young children) paid to have their bodies frozen at their death so that when a medical breakthrough happens on whatever caused their demise they can be brought back and be made well. If you are a Christian and you’ve been in Heaven for let’s say 50 years, why oh why, would you want to come back to a place of war, pollution, hatred, jealousy, envy? There isn’t a pill that can eliminate those. Instead, when I die, I’ll be in heaven–a place of peace, no tears, a big table of food–a continuous celebration. Best of all, Jesus will be there–the one who made my presence at this big party possible. I see the benefit in cryogenics for those who don’t believe the way I do. Let’s say you been in the other place–Hell– for 50 years–your thirst is never quenched, you have constant pain from the burning. At least you have “hope” you won’t suffer forever. But what happens if the power goes out at the cryogenics lab before that medical breakthrough happens? Or the people that sold you the right to be frozen goes bankrupt and they can’t pay the electric bill? Um. Sounds like a good plot to a story doesn’t it? You’ve been burning in Hell for 50 years and have been brought back. What do you do? Click here for a story about a rich man in hell who said what he wanted to happen. It is my duty as a Christian to warn them of that place of torment. 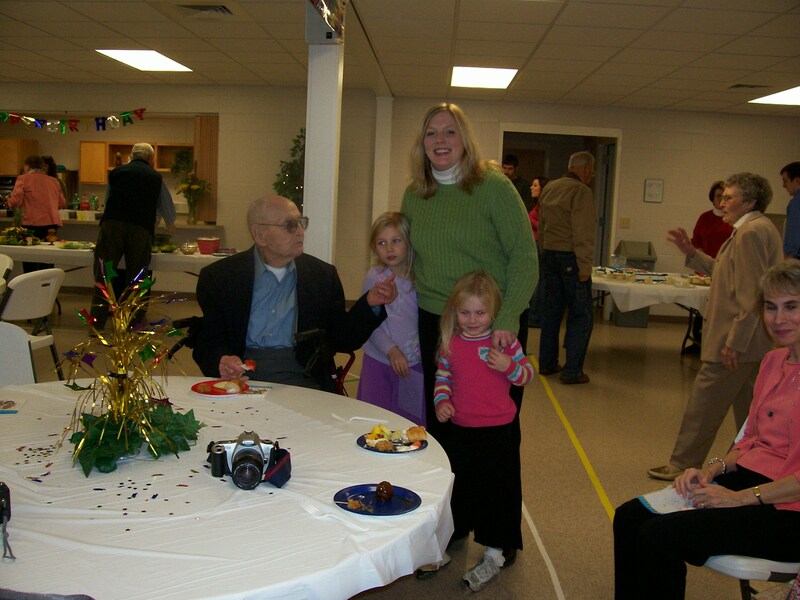 Here is a picture of my sister and her girls with our great-uncle who is 102. He’ll turn 103 in November. I’m half-way through my book, Absalom’s Beauty! I wrote 26 pages on Saturday. I don’t know how I’ll come up with enough words to write another 150 pages.